I’ve been so busy prepping for my biggest market event of the season that I haven’t been able to set aside the time to cook anything fancy. But we’ve all still gotta eat! Dinner last night was grilled cheese on homemade bread (my usual go-to of bread machine herb bread without the herbs) and orange slices. Of course, the ones I made for me were with lactose-free cheese; instead of the usual cheddar I had a rather nice Gouda, which was a nice change. I’m looking forward to the holiday market season being over so I can spend more time cooking — especially cooking for Christmas! 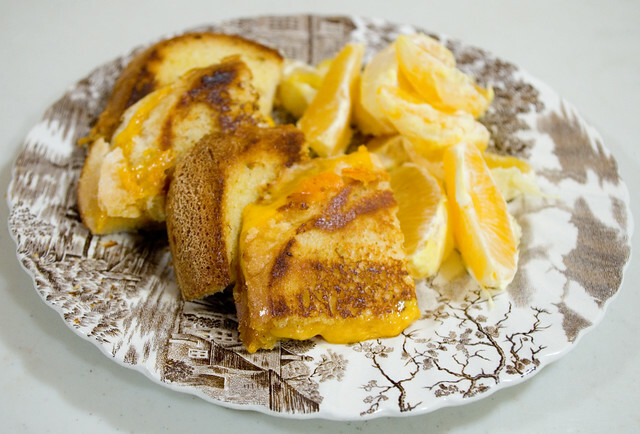 Posted on November 29, 2018 December 2, 2018 by owntwohandsblogPosted in CookingTagged bread, cheese, dinner, easy, food, grilled, lactose-free, oranges, quick, sandwich, simple, supper, toasty.